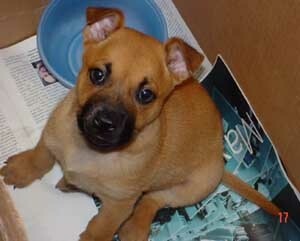 Buster was only four weeks old when he was found as a stray and brought to Town Lake. That's quite a bit of scary stuff for a little guy! Despite it all, he's good natured and seems no worse for wear. A volunteer with GSDRescueCTX took him to her office. On the way in a co-worker was smitten with his good looks and said she would adopt him on the spot!